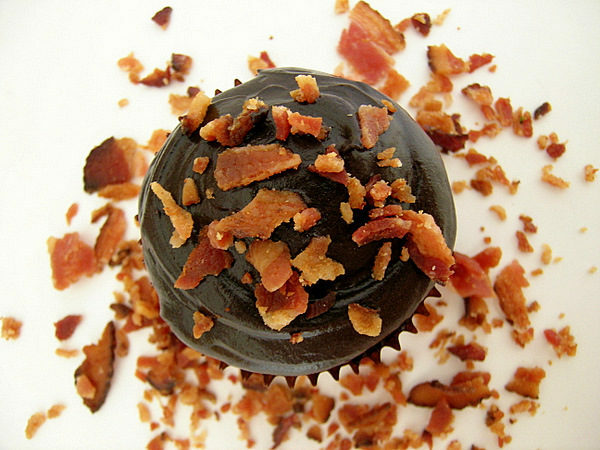 You either love it or you hate it – the dark chocolate bacon cupcake. When I first heard about this cupcake over at No One Puts Cupcake In A Corner I was instantly disgusted. I understand it’s that sweet and salty combination that you find in chocolate-covered peanuts or chocolate-covered pretzels. 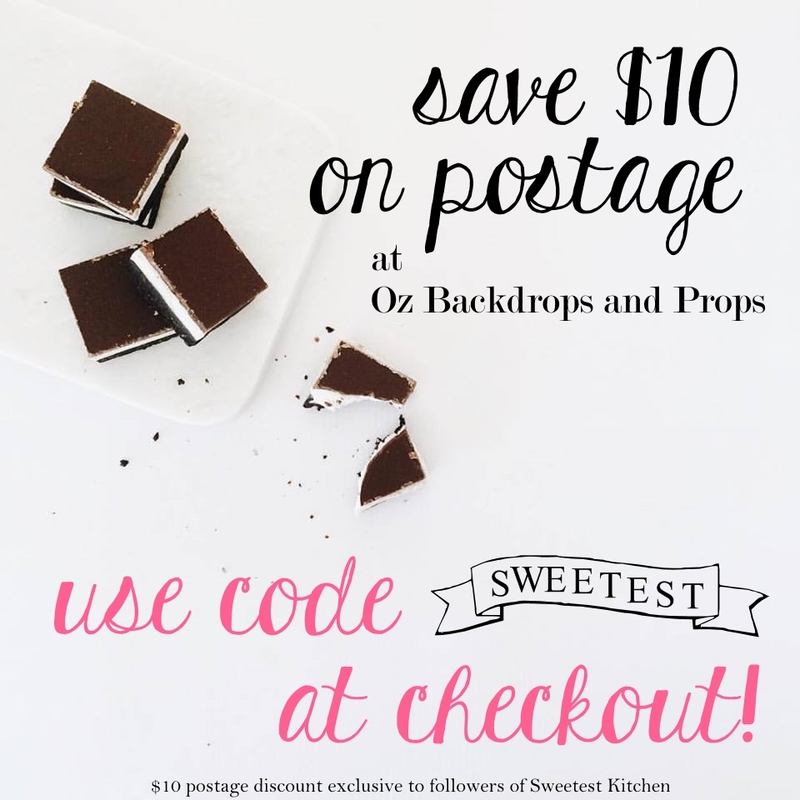 But bacon in a dark chocolate cupcake? I certainly don’t think so! Months and months went by, and for some reason I kept seeing this chocolate bacon cupcake pop up at other baking blogs and even professional cupcake bakeries. Recently, a new chocolate and bacon combination (well, it was new to me, anyway) was being sold at a local festival – chocolate-covered bacon. I wondered if I could even be paid to eat a piece of chocolate-covered bacon! But curiosity finally won over, and last week, as we had a package of bacon in the refrigerator, I decided to melt a little bit of my chocolate and dip a piece of bacon in it. It felt like I was doing something bad, and I was even appalled that I was letting myself attempt this flavor combination. I reluctantly took that first bite, and a second, and I thought that it wasn’t as bad as I had expected. I couldn’t even have explained the taste that I was experiencing. However, the fact that I had chocolate and pig meat in my mouth at the same time overwhelmed me and I couldn’t continue eating that piece of chocolate-covered bacon! Well, a few days went by, and I decided that I’d actually try out those dark chocolate cupcakes that apparently everyone was raving about. I used my own favorite dark chocolate cake recipe, from Hershey’s Kitchens, and is the exact same recipe you’ll find on a tub of Hershey’s Special Dark Cocoa. The batter for this cake is thin and watery and I decided to add my crispy, chopped up bacon on top of the batter after I had poured the batter into the cupcake liners. I didn’t mix the bacon into the batter because I was worried the bacon would sink to the bottom. The dark chocolate frosting is from Hershey’s as well, and is the same recipe that is on the back of the Hershey’s Special Dark Cocoa tub. I sprinkled leftover crispy bacon on top of each cupcake. It’s best to sprinkle the bacon on immediately after frosting each cupcake to ensure that the bacon will stick to the frosting (otherwise the frosting might set up and the bacon will just fall off). I had to try one of these cupcakes as soon as I frosted and bacon-sprinkled the very first one. I admit, I was nervous. But it wasn’t quite as bad as I had expected. What I definitely didn’t like was that even though the bacon in the batter was crispy when I added it, it turned softer and chewy in the baked cupcake. The crispy bacon on top was a nice crunchy touch, and gave the cupcake it’s main taste of bacon. In the end, I decided that I didn’t like these cupcakes and put the rest of them in the refrigerator. But guess what happened on the next day? I tried one straight from the refrigerator and it tasted better! My husband never got brave enough to try a dark chocolate bacon cupcake; my 4-year-old daughter only likes frosting, so she never tried one either, except a spoon of frosting; my 2-year-old son ate these cupcakes up like there was no tomorrow. I can definitely say I would never make a dark chocolate bacon cupcake again. However, I am still interested in trying some of the other bacon cupcakes out there, like French toast and bacon cupcakes, or caramel bacon cupcakes. 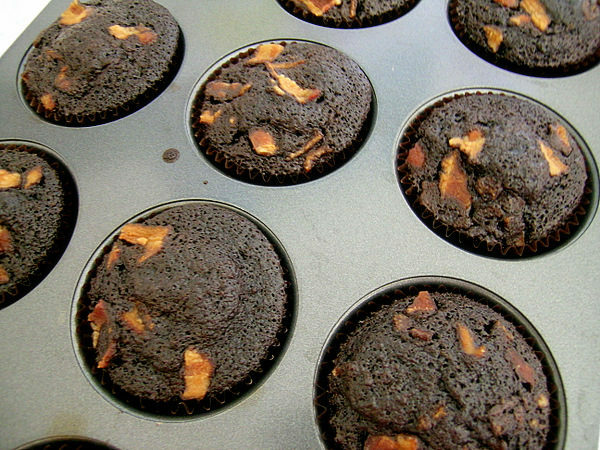 Find the Milwaukee Cupcake Queen’s original dark chocolate bacon cupcake recipe at No One Puts Cupcake In A Corner. I went to this cupacke contest and someone had bacon cupcakes, and I was shocked at how good they were! Im not much of a fan of bacon but I definitally would want to try a bite of it! As the author of the new book The Healing Powers of Chocolate, during my research I savored chocolates, big and smallI-all types imaginable–from around the globe. I enjoyed truffles, barks, clusters, cookies, brownies, lava cakes–dark, milk, white chocolates infused with every type of spice, fruit, and nut… I was in chocolate heaven. But bacon? Nah, I passed twice on the chocolate bacon bar…but it is very popular I was told. I think I’d go for salmon ‘n’ chocolate before bacon. It’s a preference thing. I’d like the chewy texture but if you told me it was bacon, I wouldn’t be smiling. Um, wow. These pictures are amazing. I am so tempted! I’m about to make peanut butter bacon chocolate cupcakes… wish me luck!